Chic Nail Color in Hit Like A Girl, Jellybean - "Chic Nail Color products are free from toxins like formaldehyde, toluene, and dibutyl phthalate (DBP) that are damaging to both your nails and health. Chic Nail Color is available at Watsons, Mercury Drug, SM Supermarkets, Robinsons Supermarkets, and department stores nationwide." TGIF to everyone! I've always been obsessed with nail polish, not because I wear them often but because I want to look at all the pretty colors. Whenever I'm at a store I can't help myself but gravitate towards the polishes. The result is a mini collection that my mom jokingly comments as "Are you planning of opening your own nail salon?" I wandered towards the nail polishes at Watsons a few days ago and found these Kathryn Bernardo line from Chic. The brand is a local one and this is my first time trying them out. I didn't have any idea on the quality of the polishes but since they only cost Php 33, I figured I could try a couple. The shade selection is really commendable as they've got really interesting colors and have different finishes. I got two pinky shade: Hit Like a Girl is a bright neon pink with a creme finish and Jelly Bean which is a glittery light pink. Hit Like a Girl is from the Knockout Collection and is a really pretty shade of bright pink. I think this is a welcome break from my greys and nudes that I normally wear. While the shade is really great, I wasn't particularly fond of the formula and application. I prefer fat brushes so the thinner, longer brush was a bit difficult to get used to. It needed two coats to get an opaque color. The main thing I had an issue with was how it chipped after only one day of wear. I applied the polish morning and the next day it chipped like hell. 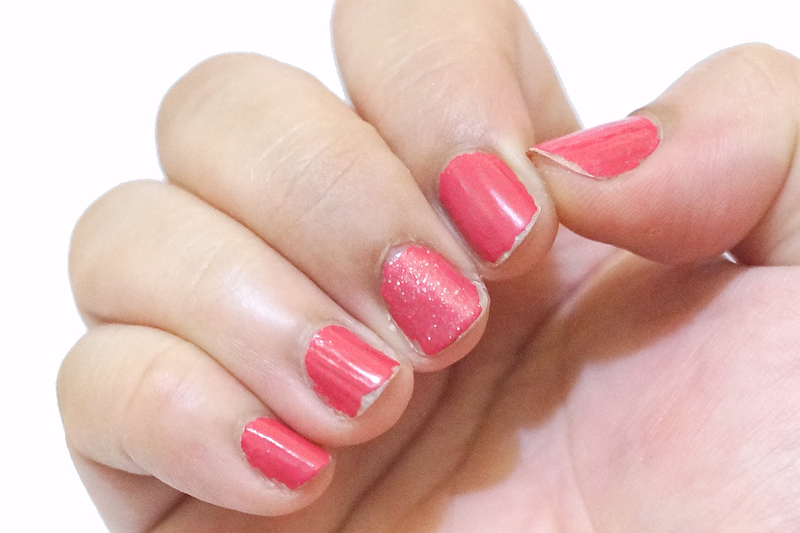 I didn't use any base coat nor top coat to see how it really fared and I'm pretty disappointed it didn't last long. I buy nail polishes on the same price range and they usually last up to three days before chipping.